Jim Padgett was born in 1932 in Lake Butler, Florida. He was commissioned a 2d Lt in the U.S. Air Force through the Air Force ROTC program at the University of Florida on July 6, 1955, and went on active duty beginning July 9, 1956. 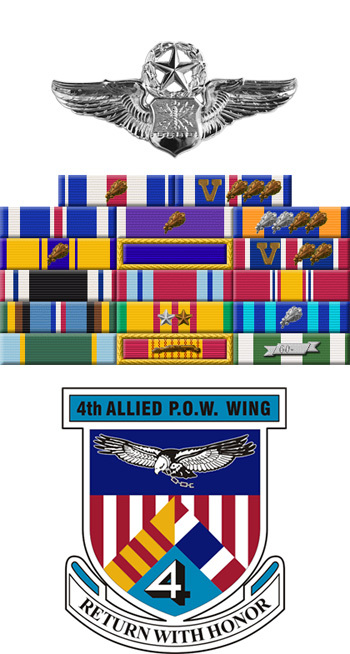 Lt Padgett next completed Undergraduate Navigator Training and was awarded his navigator wings at Ellington AFB, Texas, in August 1957, followed by Electronic Countermeasures Training from August 1957 to March 1958. His first mission was as an Electronic Warfare Officer (EWO) flying aboard RB-50 Superfortress reconnaissance aircraft with the 6091st Reconnaissance Squadron at Yokota AB, Japan, from May to December 1958, and then as an RB-66 Destroyer EWO with the 11th Tactical Reconnaissance Squadron at Yokota from January 1959 to March 1960. Lt Padgett next served as an EB-57E Canberra EWO with the 4713th Defense Systems Evaluation Squadron at Stewart AFB, New York, from May 1960 to February 1962, and then with Headquarters Syracuse Air Defense Sector and then Boston Air Defense Sector (later redesignated 35th Air Division) at Hancock Field, New York, from February 1962 to July 1966. After completing F-105 Thunderchief Wild Weasel training, Capt Padgett served as an F-105 Wild Weasel EWO with the 13th Tactical Fighter Squadron and the 388th Tactical Fighter Wing at Korat Royal Thai AFB, Thailand, from October 1966 to June 1967. His next assignment was as an F-105 Wild Weasel EWO Instructor with the 4537th Fighter Weapons Squadron and then the 66th Fighter Weapons Squadron at Nellis AFB, Nevada, from July 1967 to July 1970. Maj Padgett served as an F-105 EWO with the 561st Tactical Fighter Squadron at McConnell AFB, Kansas, from July 1970 to April 1972, and then deployed as an F-105G Wild Weasel EWO with the 17th Wild Weasel Squadron to Korat Royal Thai AFB from April 1972 until he was forced to eject over North Vietnam and was taken as a Prisoner of War on May 11, 1972. After spending 322 days in captivity, he was released during Operation Homecoming on March 28, 1973. LtCol Padgett was briefly hospitalized to recover from his injuries at Westover AFB, Massachusetts, and then served as an F-105G and then F-4G Phantom II EWO with the 561st Tactical Fighter Squadron at George AFB, California, from September 1973 until his retirement from the Air Force on March 1, 1982. 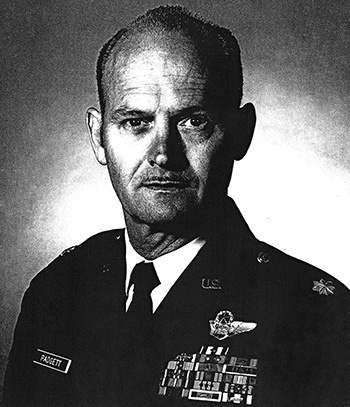 Captain James P. Padgett distinguished himself by gallantry in connection with military operations against an opposing armed force over North Vietnam on 8 May 1967. On that date, Captain Padgett was Electronic Warfare Officer in the lead aircraft of a flight of F-105 Thunderchiefs providing surface-to-air missile suppression for a large strike force. Despite intense and accurate flak and an attack by surface-to-air missiles, Captain Padgett assisted in the attack on two hostile missile sites, resulting in damage to one and total destruction of the other. By his gallantry and devotion to duty, Captain Padgett has reflected great credit upon himself and the United States Air Force.